$748,000 CAD Definitely worth it!! Style: Single Story "plus an over-sized bunkie!" Bedrooms: 3 "plus the bunkie with 4 beds + sofa bed!!" Bathrooms: 1 "3pce cheater ... shared with bunkie"
Basement: No "the cottage sits on piers"
Size: 1,200 sq. ft. "approximately + 330 sq ft bunkie"
Lot Size: 2.19acres 300ft x 300ft "300' of clean, weedfree shoreline"
Situated in a high-end waterfront neighbourhood halfway between Perth & Smiths Falls, this could arguably be one of the nicest spots on Big Rideau Lake. EXTREMELY private & nicely treed, with year round access, amazing views and 300 feet of clean weedfree shoreline... this 'hard-to-come-by' property will certainly appeal to all discerning buyers! The charming 3 season log cottage has a classic Muskoka feel with pine floors, soaring ceilings and a huge central stone fireplace. 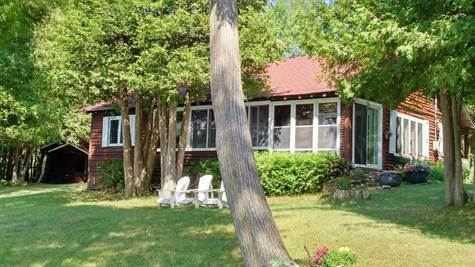 The spacious living/dining area leads to the lakeside screened porch where sunset views can be enjoyed in comfort. And the functional u-shaped kitchen is just steps away from the bbq and picnic area. There is plenty of room for family and friends with 3 bedrooms in the main cottage and lots of sleeping space in the over-sized bunkie (which has easy access to the 3 pce cheater bath!) Ample docking - perfect for lounging, swimming and boating... and space galore for gardening and outdoor activities (or your new year-round home?!). Definitely worth the investment !!! ▪ Dock section that is parallel to the shore is a permanent structure. The ramp and floating section are removable. ▪ You can walk into the lake from the shoreline and the water is approximately 8' deep at the end of the dock.